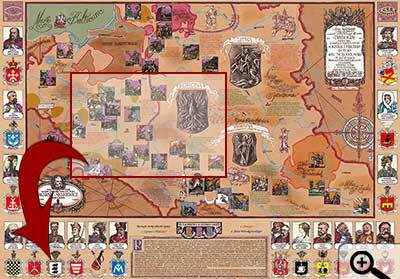 Szymon Kobylinski , the distinguished graphic and lover of Trilogy by Sienkiewicz decided to present it on the Polish Republic's map. The author illustrated portraits of the most important characters with their armorials and presented images of the most interesting events from the novels, enriching them with quotations from the Nobel winner. 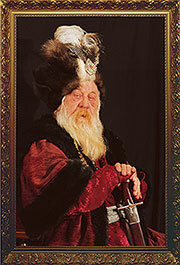 The artist with the fantasy chracteristic for him, created uncommon graphic composition in old leather painted map style. The supplementary text is the real dispute with Sienkiewicz , presented in a very attractive and fascinating form. We encourage you to walk in the steps of "With Fire and Sword"("Ogniem i Mieczem"), "The Deluge" ("Potop"), "Fire in the Steppe" ("Pan Wołodyjowski") characters and we hope that this map will not only become helpful in reading successive pages of Trilogy, and watching its film version, but it will also become a fascinating feast for all the lovers of this masterpiece by Sienkiewicz. 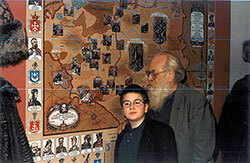 Szymon Kobyliński as the Senator Michał Ostroróg in the film "Ogniem i Mieczem"
Szymon Kobyliński with his grandson in front of his map "walking in the Trilogy steps" during opening the exhibition of requisites from the film "Ogniem i Mieczem" in the National Museum in Warsaw.